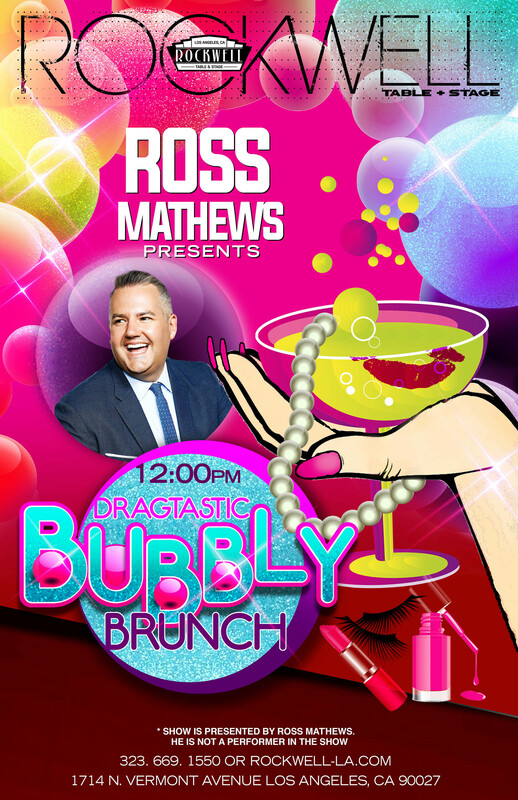 Article: Renowned TV Personality Ross Matthews Presents An Exciting “Dragtastic Bubbly Brunch” At The Rockwell Table & Stage – Join In On The Fun Every Saturday! Los Angeles is always bustling with a countless amount of fantastic, brunch spots to try out; and just recently, the Rockwell Table & Stage kicked off their exciting “Dragtastic Bubbly Brunch,” that will give all other restaurants a run for their money. Every Saturday, you can enjoy a marvelous mimosa to start off your day while having fun at an interactive event with some of the most fabulous drag queens. The event is presented by the one and only, fan-favorite TV personality, Ross Matthews. Guests will truly be able to have the time of their lives sipping on some delicious cocktails and mimosas and tasting the mouth-watering items on the Rockwell Table & Stage’s menu. In addition, attendees will even be able to join in on the “lip sync for your drink” contest and show off their singing skills for a chance to win a free cocktail. Needless to say, everyone is bound to have an endless amount of fun at the Rockwell Table & Stage’s “Dragtastic Bubbly Brunch.” Grab all of your friends and get ready for an unforgettable time at the Rockwell Table & Stage’s magnificent, brunch event. You can get tickets to the “Dragtastic Bubbly Brunch” here. Previous VIPAccessEXCLUSIVE: Shiseido Celebrated The Launch Of Its New Makeup Collection With A Makeup Master Class And Cocktail Party Hosted By Global Color Artist Patrick Ta – RECAP Here! Next Article: Nickelodeon Has A Lot Of Spooky Fun, Halloween-Themed Premieres All Month Long – Take A Look At The List Of Exciting, New Episodes Here!